DeANNA,17, a young hottie, seduces MELVIN the class nerd, only to set him up for a cruel April Fools joke. She’s joined in her prank by MISSY, the goody-two-shoes; her boyfriend MALIK, EVA the hip-hop diva; SCOOP, the jock; and DIEGO the bad-boy. Feeling a bad for Melvin, Missy stops the taunting, but Diego presses the issue… Until things spiral out of control and Melvin is accidentally killed. One year later, on April Fools Day, each of the teens are targeted and killed in succession. 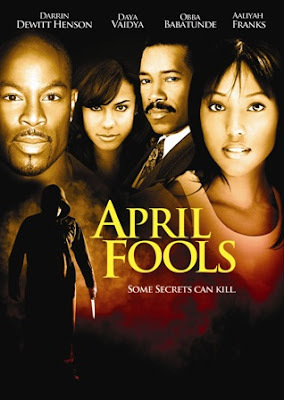 Missy’s father, DETECTIVE COMBS (Obba Babatunde) and his partner, DETECTIVE WARD (Darrin Henson), go to work on the case, trying to find out who’s behind the killings and stop them before day’s end – before they can take Missy’s life too. You are currently browsing the archives for the April Fools category.